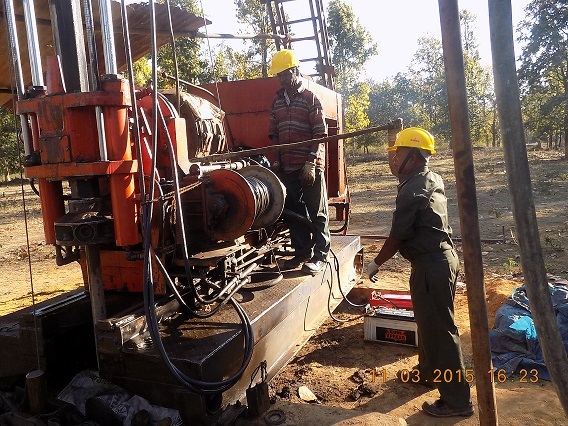 Mineral Exploration Corporation Limited (MECL) has made noteworthy contributions in development of the nation by exploration of coal, lignite, base metals, gold, bauxite, limestone etc. and has achieved several distinctions. It has a manpower force of around 1500 dedicated executives and non-executives. MECL, with the developed infrastructure and expertise, is committed to execute cost and time effective comprehensive programme’s from reconnaissance survey to pre-feasibility studies on turnkey basis. It will “leave no stone unturned” to achieve the goals, singly or in association with suitable strategic partners in the present economic reforms. Apart from an excellent atmosphere for growth, the company offers a package of remuneration that compares with the best in the Indian Industry. It includes Basic pay, Variable Dearness Allowance, Cafeteria Allowance, House Rent Allowance, Conveyance Maintenance Reimbursement, Contributory Provident Fund, medical reimbursement for self and dependents, Gratuity, etc. MECL advertises the vacancies in the newspapers and displays the same online. Only the applications specific to the advertisements are entertained which are received during the time limit stipulated in the vacancy notification/ advertisement. The applications without reference to specific notification are neither entertained nor replied to. The candidate has to register online and fill up necessary details against each vacancy notified. Only those candidates who fulfill eligibility criteria of age, qualification, experience and reservations if any, can apply. All originals will be checked at the time of interview. Broad terms and conditions and general instructions which are specific to the advertised posts are incorporated in the advertisements/ vacancy notification. Vacancies are notified or advertised as and when there is manpower requirement for any discipline. 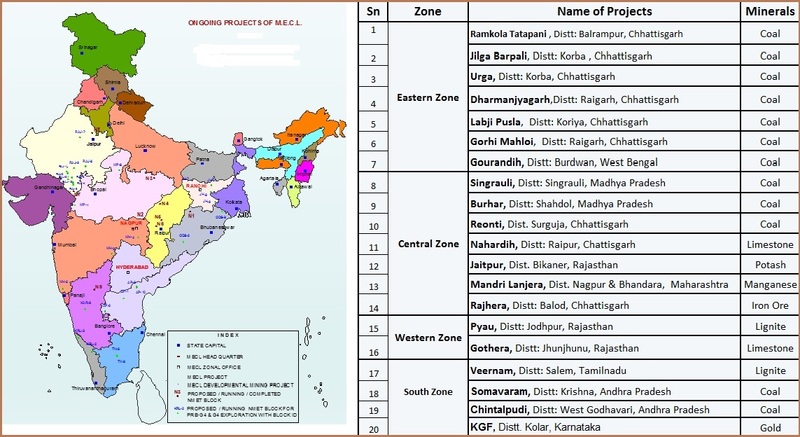 The executives and non-executives in MECL are transferable to any of its Offices, in Central Headquarters, Zonal offices,Maintenance Centers and Project sites all over India. A)	Project Headquarters are located in townships, but the worksites are located in surrounding villages, where normal amenities are not available in comparison to cities. Accordingly, the applicants are advised to be ready to live in the field/remote area and to work in difficult working conditions. 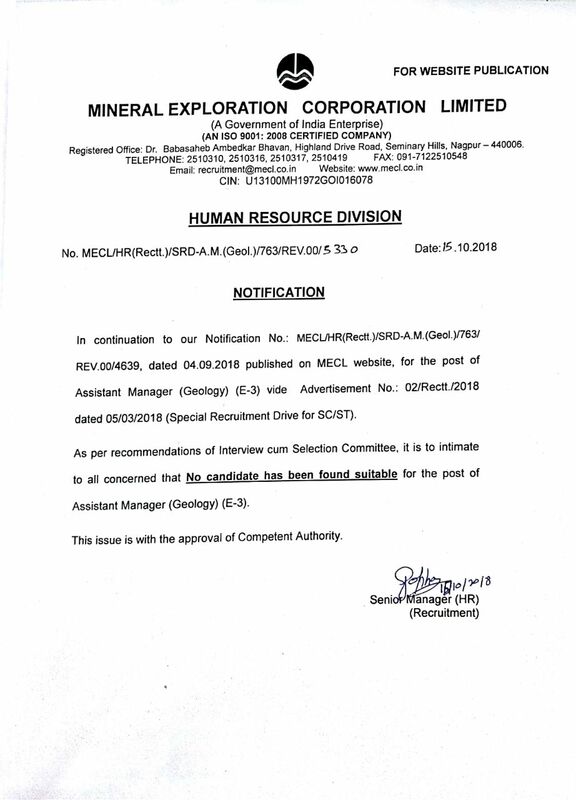 Notice regarding cancellation of the recruitment process for the Post of Assistant (HR) (W-4) advertised vide advertisement no. 03/Rectt./2018. Notice regarding cancellation of the recruitment process for the Post of Assistant (Accounts) (W-4) advertised vide advertisement no. 03/Rectt./2018. Notice regarding cancellation of the recruitment process for the Post of Assistant (Materials) (W-4) advertised vide advertisement no. 03/Rectt./2018. 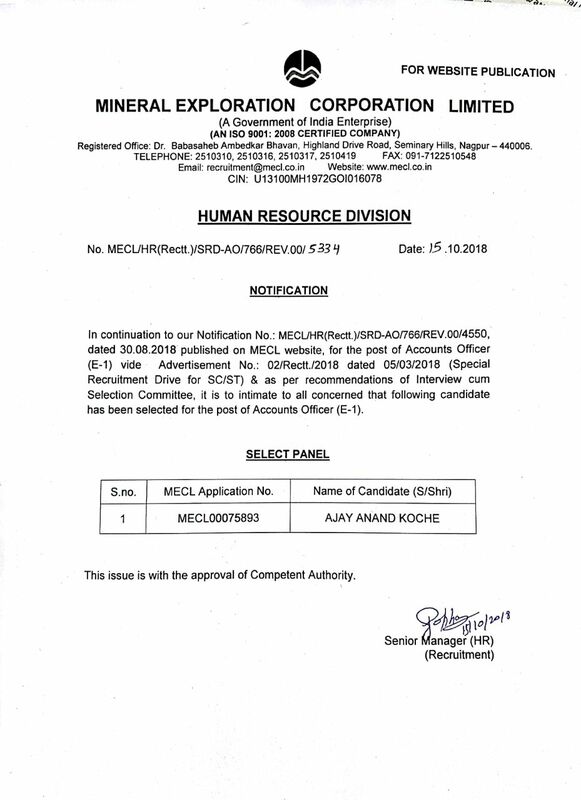 Postponement of Personal Interview for the post of Procurement & Contract Officer (E-1), Advt. No. 03/Rectt./2018. 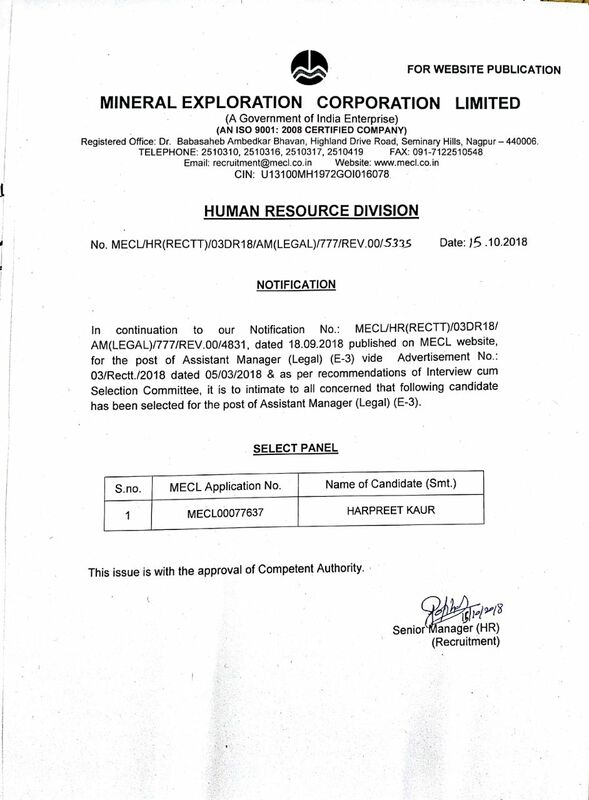 Postponement of Personal Interview for the post of Assistant Manager (Procurement & Contract) (E-3), Advt. No. 03/Rectt./2018. Postponement of Written Test for the post of Assistant (Materials) (W-4), Advt. No. 03/Rectt./2018. Shortlist for Document Verification & Skill Test for the post of Assistant (Accounts) (W-4), Advt No. 03/Rectt./2018. Result Notification to the post of Stenographer (English) (W-4), Advt no. 03/Rectt./2018. Shortlist for Document Verification & Skill Test for the post of Assistant (HR) (W-4), Advt No. 03/Rectt./2018. Shortlist for Written Test for post of Assistant (Materials) (W-4), Advt No. 03/Rectt./2018. 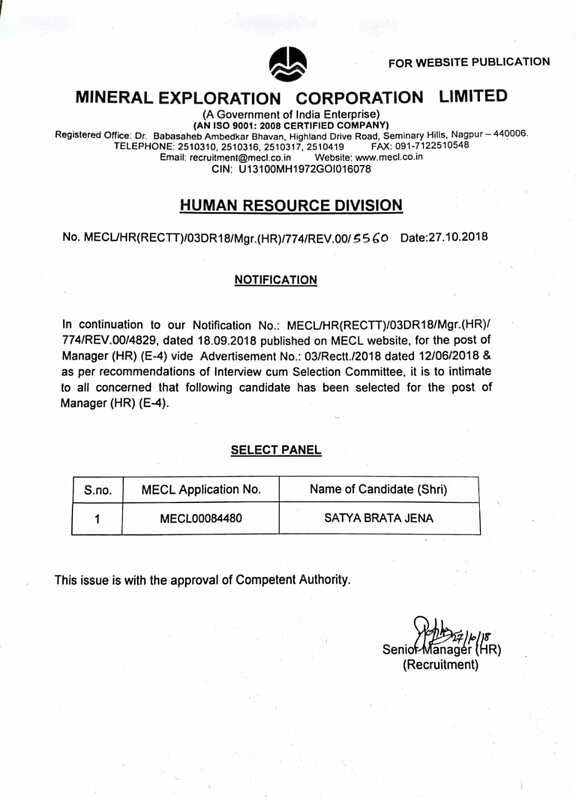 Result Notification to the post of Machinist (W-4), Advt no. 03/Rectt./2018. Shortlist for Written Test for the post of Technical Assistant (Survey & Draftman) (W-7), Advt No. 03/Rectt./2018. Shortlist for Written Test for the post of Assistant (Accounts) (W-4), Advt No. 03/Rectt./2018. 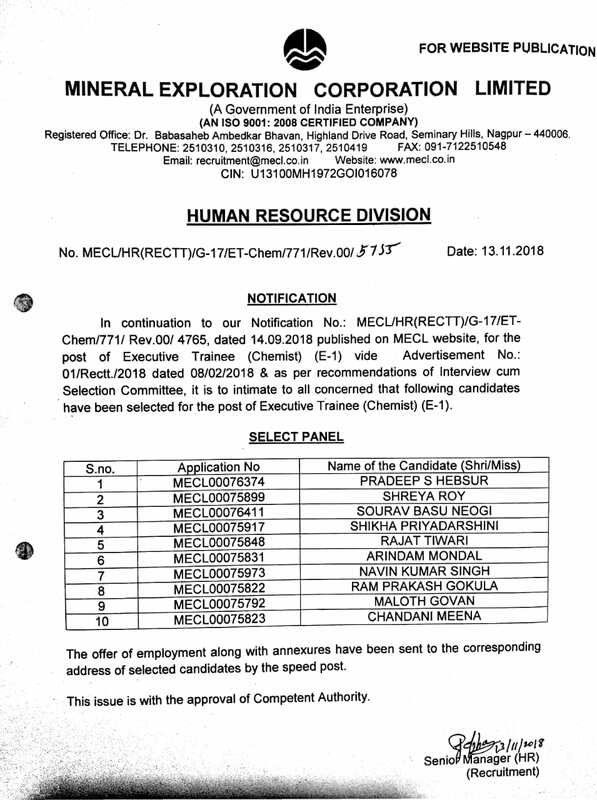 List of Eligible Candidates to be called for Personal Interview to the post of Deputy General Manager (Finance) (E-6), Advt No. 03/Rectt./2018. Shortlist for Written Test for the post of Jr.Driver (W-3), Advt No. 03/Rectt./2018. 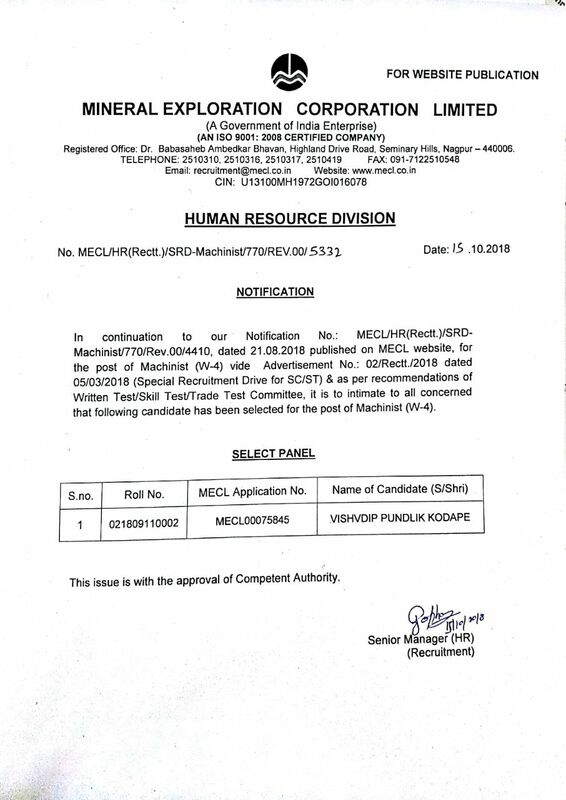 Shortlist for Written Test for the post of Operator (Computer), Advt No. 03/Rectt./2018. Shortlist for Written Test for the post of Mechanic, Advt No. 03/Rectt./2018. Result Notification to the post of Foreman (Drilling) (W-7), Advt no. 03/Rectt./2018. 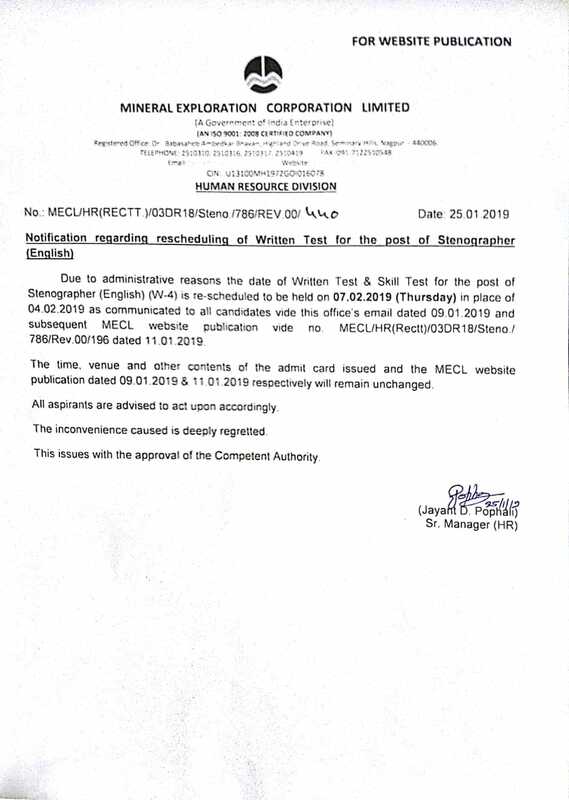 Rescheduling of the date of Written Test & Skill Test for the post of Stenographer (English) (W-4) on 07.02.2019 (Thursday) in place of 04.02.2019, advt no. 03/Rectt./2018. 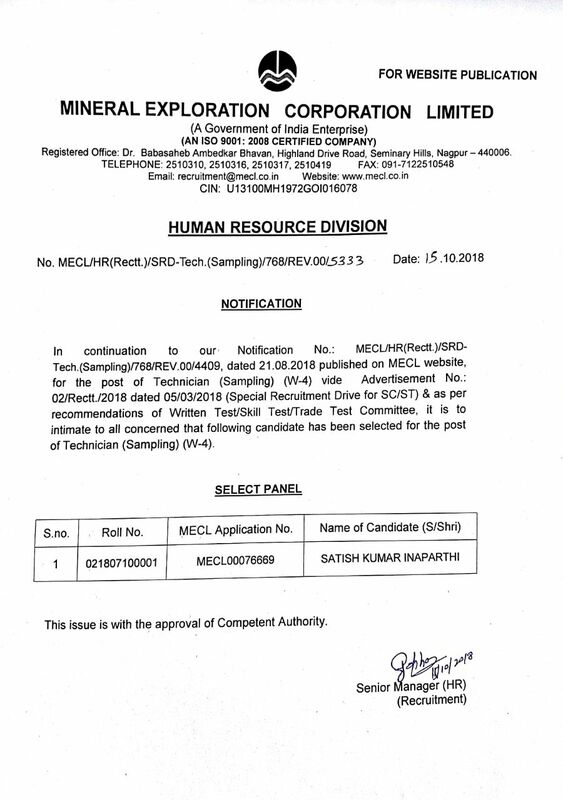 Shortlist for Written Test for the post of Stenographer (English) (W-4), Advt No. 03/Rectt./2018. Shortlist for Written Test for the post of Library Assistant (W-4), Advt No. 03/Rectt./2018. Result for the post of Technician (Drilling) (W-4), Advt. No. 03/Rectt./2018. 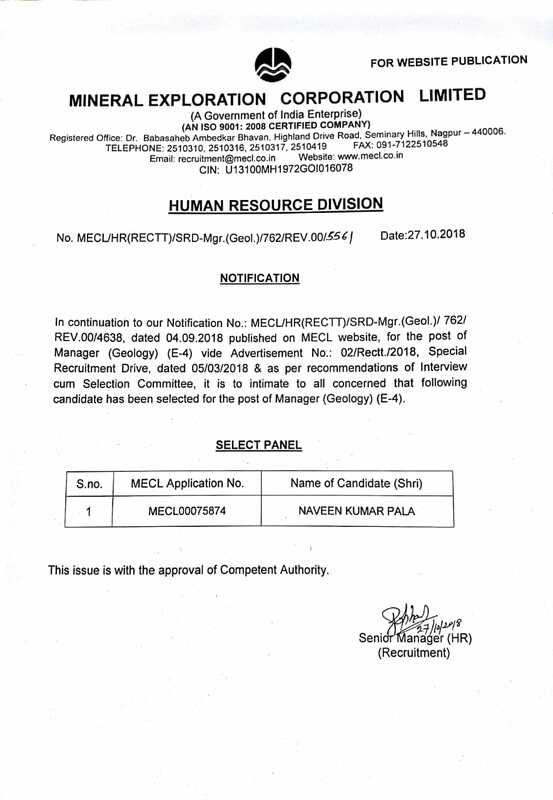 Rescheduled of Personal Interview for the post of Manager (HR) on 27/09/2018(Thursday) in place of 24/09/2018, advt no. 03/Rectt./2018. Box Advertisement No. 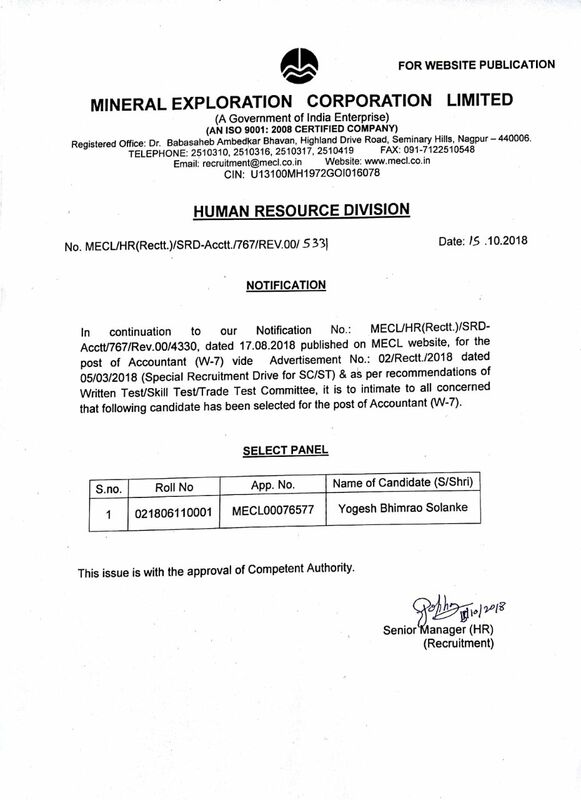 03/Rectt./2018 - Recruitment for Various Posts in MECL. Login for registered and New candidates..